Tartelette: Lemon Cakelets With Vanilla Bean Cream And Olive Oil Bittersweet Chocolate Pots de Creme. Sift together the flour mix or all purpose flour, cornstarch, lemon zest and sugar together. In a stand mixer fitter with the wire whisk attachment, beat the egg whites until soft peaks. Add the flour mix to the egg white and fold gently with a large spoon. Spoon the batter, a couple of rounded tablespoons at a tie onto a greased baking sheet. Bake for about 10 minutes, until the cakelets are golden and puffed up. In a large bowl, whip the heavy cream and sugar until soft peaks. Cut the half vanilla bean in half lengthwise and scrape the seeds out with the back of a pairing knife. Add the seeds to the cream mixture and continue to whip until firmer peaks form. Fill the cakelets with a couple of tablespoons of the vanilla cream and refrigerate until ready to eat. In the meantime, bring the milk and cream to a simmer in a large saucepan set over medium high heat. Remove from the heat and add the chocolate to the mixture. Slowly whisk until the chocolate is completely melted. (return over low heat if it needs a bit more heat to dissolve). Slowly pour the chocolate mixture over the egg yolks and honey, whisking constantly until both mixtures come together. Add the olive oil and stir briefly. Garnish with chopped pistachios and a drizzle of extra virgin olive oil. The bittersweet chocolate pots sounds divine :) Hope you settle in well in Birmingham, its always fun experiencing the 'firsts' in a new place. Heavy cream - of course! Makes a whole lot-ta difference. These look absolutely scrumptious. I love all of these firsts, and I love that we get to live them alongside you. Those lemon cakelets look incredible, and the chocolate too. Swoon. Enjoy that time with your old pup. It's special. I love these dainty little cakelets. This could be because I enjoy any reason to consumed whipped cream in large unadulterated quantities, but it could also be the beautiful photos and styling. Those cakelets are absolutely stunning! Now do you deliver? Because I need at least a dozen of these stat! Both of these recipes look devine. I love anything lemony. What kind of texture are these cakeletes? Spongy, crumply, crispy? I would add more lemon in the cream to get more zing. ;) thanks for sharing. Karine: they are spongy. You could add more lemon in the cream, and I have before, this time I wanted the contrast vanilla-lemon and not just tone on tone. Both of these are beautiful and sound delicious! Welcome to Birmingham!!! I was born and raised here and absolutely love it! After living in CA for the last 11 years, it was pure heaven to move back home where I belong!!! Hope you'll start feeling that way too soon!!! Helen, your recipes and photos have always been awe-inspiring. I liked the way you've transformed sponge cake into cakelettes and the idea of adding olive oil chocolate pot de creme. 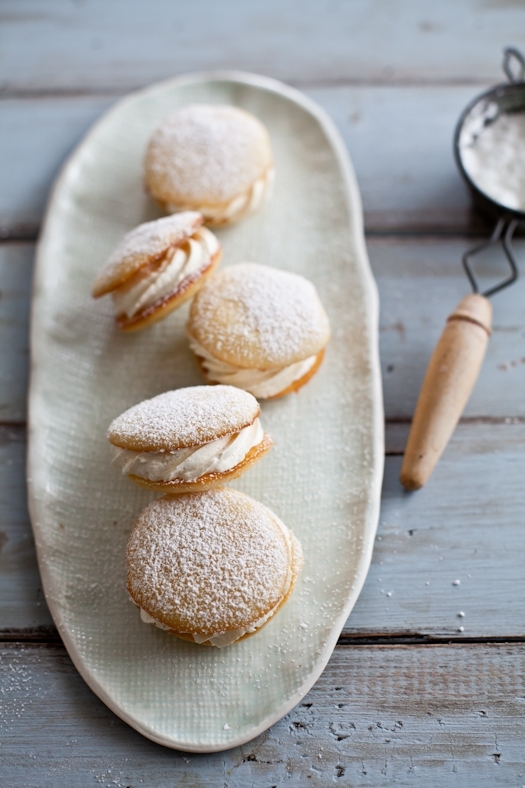 These lemon cakeletes look delicous! I love all your photos! 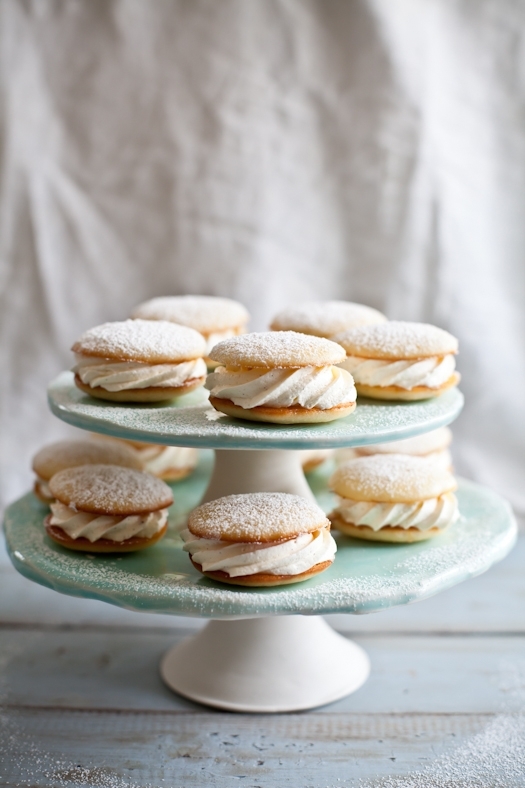 These lemon cakeletes look delicious! Helene, I love your photos! These cakelets make me want to just curl up with a pot of tea and a good book! Unfortunately, I think I'd end up eating them all! Those cakeletes are exquisite and precious photos!!! Beautiful photographs. Posting a lovely narrative and recipe is definitely not a first for you! Such beautiful, daintly tarts. Perfect for enjoying on a spring afternoon with a cup of tea. Lovely! Thank you for sharing! I keep seeing the pairing of chocolate and olive oil together and keep being more and more intrigued! The only time I've had olive oil drizzled on a sweet was at the Bi-Rite creamery in San Francisco. They have this amazing sundae that has chocolate sauce and blood orange-infused olive oil drizzled over it with some sea salt sprinkled on top. Sounds kinda crazy, but it was the tastiest sundae I've ever had. Having recently relocated myself, I can totally relate to all of the exciting 'firsts' and the even more exciting thoughts of sharing them with those you love.. Thank you for this lovely post.. the recipes and photographs are exquisite! The cakelets look lovely but the way you write is what drew me in. Your post flows perfectly and is so beautifully written. those cakelets look so sweet! I love how airy the cakelets feels. 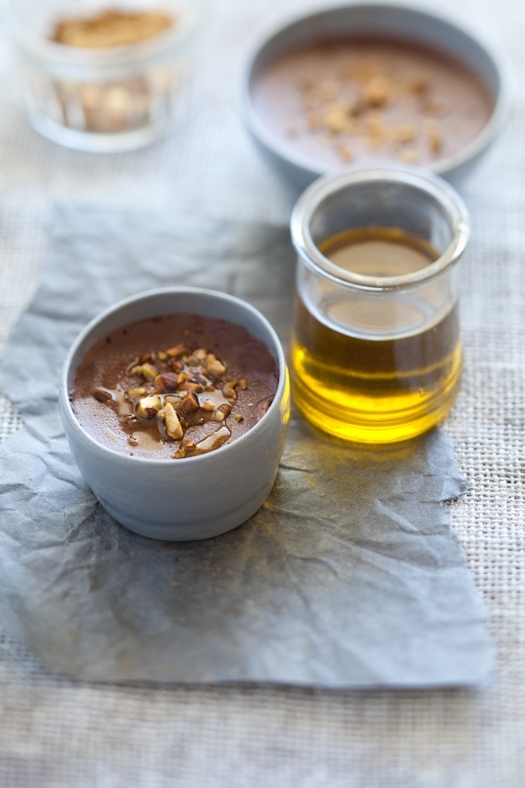 Never ever thought of adding olive oil in pots de creme. Delish! 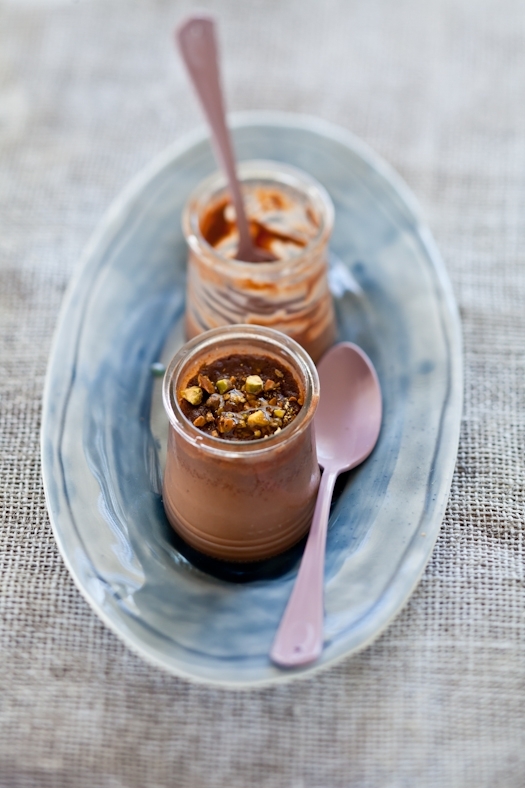 I love those little pots your chocolate pots de creme are in. I brought some back from France on my last visit and love them! Those lemon cakelets look so delicate and delightful. I am going to have to have a go at baking some. If they come out as good looking as yours they will be gone in minutes! Thanks for sharing. I just discovered your website. Your photos are stunning, and the recipes sound delicious! I will definitely be making these pots de creme!! Glad you're enjoying it there. The dessert is lovely. I have to say that those Bittersweet Chocolate Pots de Creme look amazing! Oooh, these looks so delicious! I think that some peanut brittle may go beautiful with the creme pots too! Both these desserts look lovely. I'm definitely going to have a go at cooking them. I have never heard of olive oil being used in puds. I know that you likely hear this all the time but I really wanted to drop you a quick line to say how much I love your book and what a difference it has made in my photography. You have taken me from horrendous to emerging amateur and I truly appreciate it. oh my goodness - these chocolate pots sound delicious! I like the way you have served them in the jars. Today I am making your apricot and almond tart for my mother's day dinner tonight - so delicious! 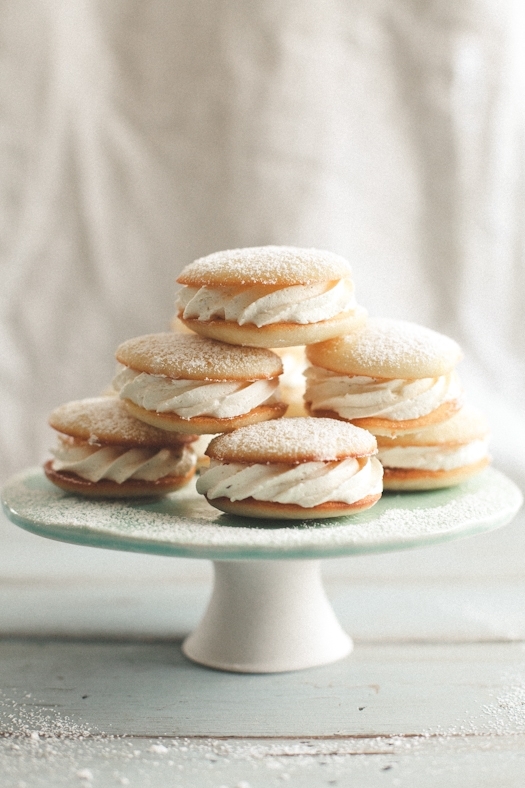 The Lemon Cakelets with Vanilla Bean Cream look so sweet, I am planning to make them for my little sister's rehearsal dinner. Just a quick question, for the filling, it just says 1/2 vanilla bean; is this 1/2 a tsp? It looks delicious! I'm already following you, so I don't loose a bit! I just bought your book, I was thrilled! Wow! They both look delicious, I hope I can make them and have them look as good as yours. Thanks for sharing! I am making the lemon cakelets. But the mixture is so fluid that I can't make nice round cakelets with it. I followed the recipe. What did I do wrong? Emine: I am thinking that the flour was not measured the same. The batter should definitely holds its shape. It's pretty fluid though. Maybe add a tad more flour to yours.